It doesn’t get much better – a gorgeous heritage nunnery, a brisk but sunny western Queensland day, playful kittens, great friends, new friends, incredible stories and NEW SONGS! After co-writing a rousing blues track with Emma Bosworth, based on lovely Joyce’s story of her deep love and commitment to her passed World War 2 service husband, I had the honour of sitting with Claudia Ehlers who’s story, in many ways, parallels my own in terms of the “Italian Connection”. Claudia is a first generation Australian – of Italian extraction. Just like me. Her father, a proud Italian man, with little English, found his travelling way to Australia in the late 60’s and experienced a life changing road accident. Taken to a little hospital in Cunnamulla, the age old “Nightingale” story came to bare as his nurse became his wife, despite issues of difference of culture, lack of language and families living half a world apart. Their family history tells a story of guts, determination, and single mindedness. Claudia’s Nonno, her fiery and adventurous Italian father’s father, was a Sicilian man, set to conscript in the Italian WW2 navy. He was sent to fight in Africa, a southern sail from the bottom coast of Sicily. He got on the boat. He didn’t want to. But he got on. He paced the deck. He stood at the front of the boat and wished for land. Wished for another choice. He went down below deck. Slept a few hours a night. Paced the deck. Stared out to sea. And then he jumped off the back of the boat and headed for home. Swimming for his life and to regain the connection of his family and what he wanted to live and fight for. Arms sore, heart pounding, wondering what the hell he had done, he turned to see the path that he left behind. The boat from which he jumped exploded as he watched. Exploded into rubble, flames and wooden pieces … and sank to the bottom of the ocean. Giovanni kept swimming toward his family and away from the choice that he never made. Once he made land (yes he made land!!) he made contact with his family and laid low for many years until such time as the war subsided and he could properly reconnect with his family. This song bowled itself out of myself and Claudia with the fabulous help of Harry Wells on guitar and Bree Wells and Emma Bosworth on vocals. It took all of 1 hr to arrive into our laps and gave us heaps more pleasure after that. 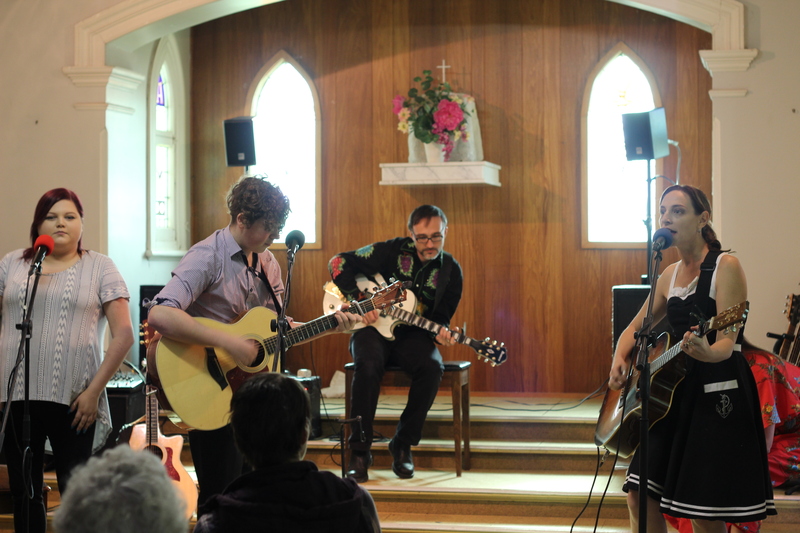 While Claudia couldn’t make the performance that we delivered on the final afternoon of our residency in Dalby, when we sang the song a real ripple of excitement and light flowed through the chapel – people immediately sang along and grabbed onto the essence of the story as if it were their own. We drove home that night high on the energy from that show and all the great new stories and songs we’d been blessed with. Such a great feeling. The 4 hour drive felt like no time at all. Claudia is a woman who has bravery and adventure etched into her veins. She is descendant of a number Soldier’s Wives. Strength, tenacity and the ability to look at issues and problems from a variety of angles epitomises this woman. She’s quite the inspiration. And way cool too!